​For a romance to work, audiences have to want to see the lovers end up together. Some of that needs to be created by the movie itself: how they meet, how convincing their relationship is and, eventually, what obstacles are keeping them apart. Half of that battle can be won by casting two likable actors with good chemistry. The makers of Submergence won that part by getting James McAvoy and Alicia Vikander to play the two lead roles. I like both of these actors. They exude intelligence and charisma whenever they appear on-screen. Here, though their characters do not know each other for very long, it is important that their moments together are enjoyable because they spend the second half separated. The good news is that their section is the best in Submergence. The bad news is that both of their subplots are boring, thus making the rest fairly dull. The story gets us halfway there, but it is unable to take full advantage of its stars. ​Vikander’s Danielle studies ocean life and McAvoy’s James is a government agent. They meet at a nice resort and take a liking to each other immediately using clever (and mildly witty) dialogue that is fitting for two people who are supposed to be really smart. Time is spent exploring their surroundings, which are quite beautiful. That lends an idealism to those scenes, giving them both something easy to visualize when they are apart. There are plenty of shots of the leads (especially Vikander) gazing off into the scenic distance. McAvoy and Vikander are both good. There is surprisingly little physical passion to their desire. Thankfully, their conversations are intriguing enough that they made me want to see more of them together. So that aspect of the production is reasonably successful. Unfortunately, the movie around them does not live up to their promise of those scenes. ​Both characters have their own lives, with subplots that could possibly fill an entire film on their own. But as just one piece of a larger puzzle, it is too much. There is not enough of them to be interesting on their own and too much of them to fit comfortably with the rest of the action. 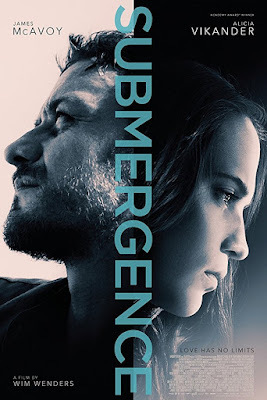 In its second half, Submergence becomes more about their individual problems. It distracts from the potentially compelling love story at its center. It feels like three different movies: his, hers and theirs. And the lesser two take something away from the better one. 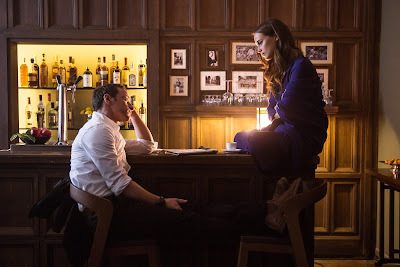 ​Submergence starts slow, which I appreciated since it allowed us to get to know Danielle and James. A deliberate build can work well in this kind of story. However, it stays at that pace all the way through and does not go anywhere particularly exciting. For fans of the stars, a number I count myself among, it is worth a viewing. For everyone else, it is okay. The romance stuff is pretty solid, but once McAvoy and Vikander get separated, things bog down quite a bit. It is too bad that, in the end, Submergence winds up being a little less than the sum of its parts.